It’s pretty amazing what you can do with paint. Not only can you simply give an item a new color but you can also change the look of the material. 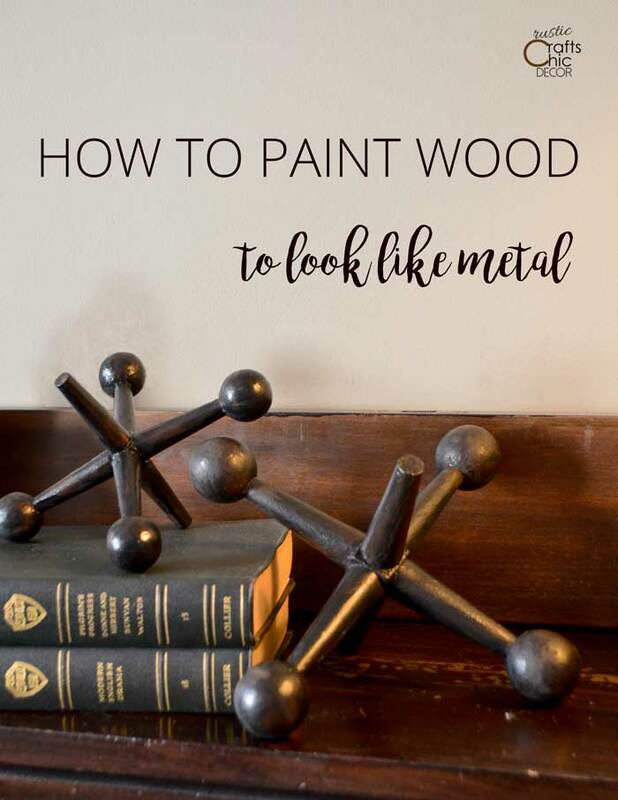 Whether you want something to look like metal, wood, or even tree bark, there is an easy technique. 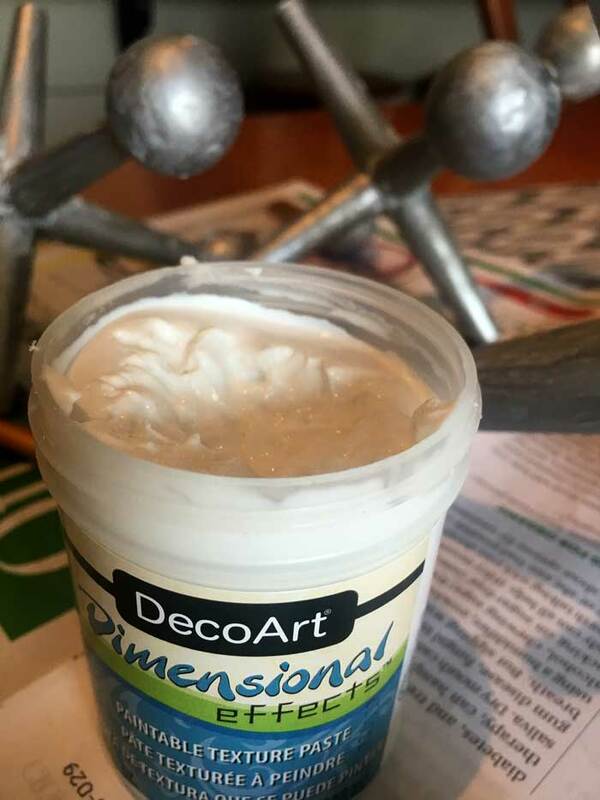 I’ll show you how to make wood look like metal with a simple paint technique that includes an item from your pantry. I recently did a project where I painted a vase to look like birch bark. It was so rewarding and fun that I wanted to try something else with paint. Years ago, I bought a set of three wooden jacks from a flea market. At the time, I just painted over the bright colors with a silver metallic paint. This made them look like the original jacks that kids play with. 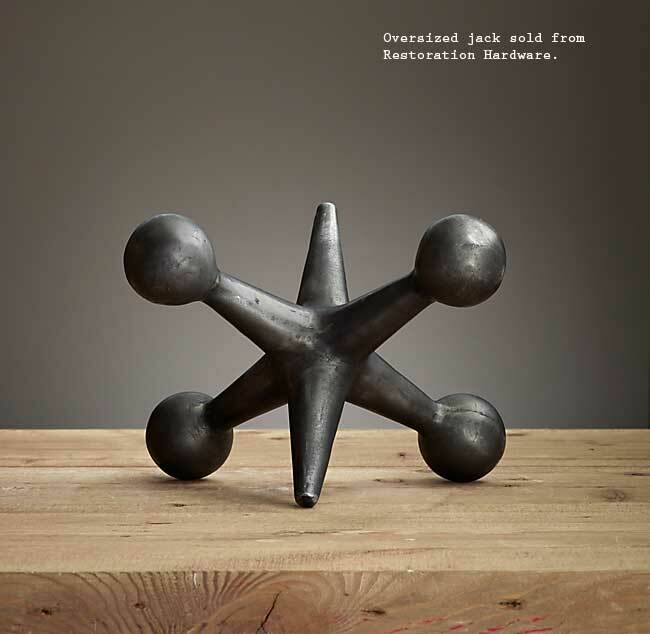 However since then, I keep seeing oversized jacks, like this one from Restoration Hardware, that look more like blackened iron. I love the rustic industrial look of these and decided to try and transform my wooden jacks once again. I used this Restoration Hardware jack as my inspiration for the paint finish on my jacks. It is a blackened steel with variations in the shades and textures. Here is what I am starting off with. 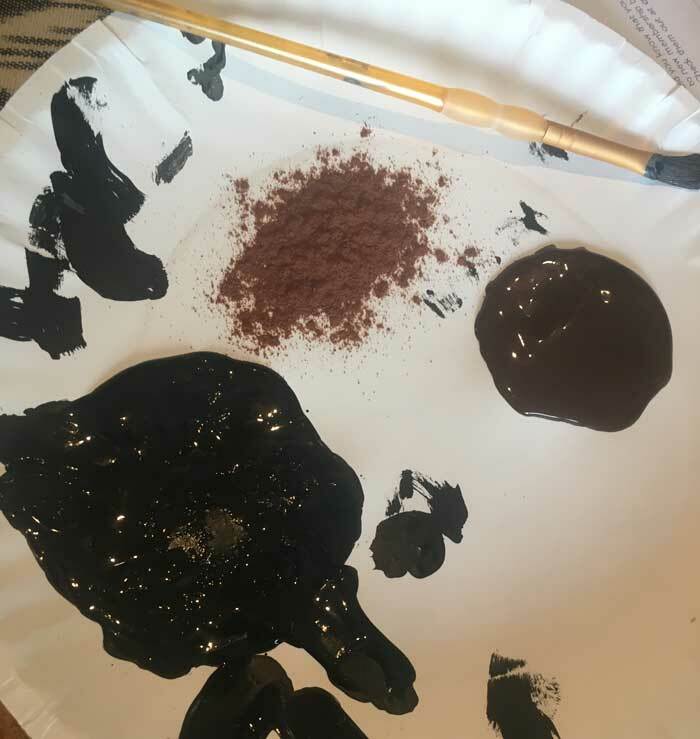 I’ll show you how I change the look of them with paint, texture paste, and a little cinnamon. When I originally painted these, I was wanting just a solid metallic finish. If you just want to know how to make wood look like metal that is solid, metallic paint is the answer. Just spray or brush it on and you’re done. However, when you want an older more rustic look, there are ways to add dimension and character with a couple more steps. 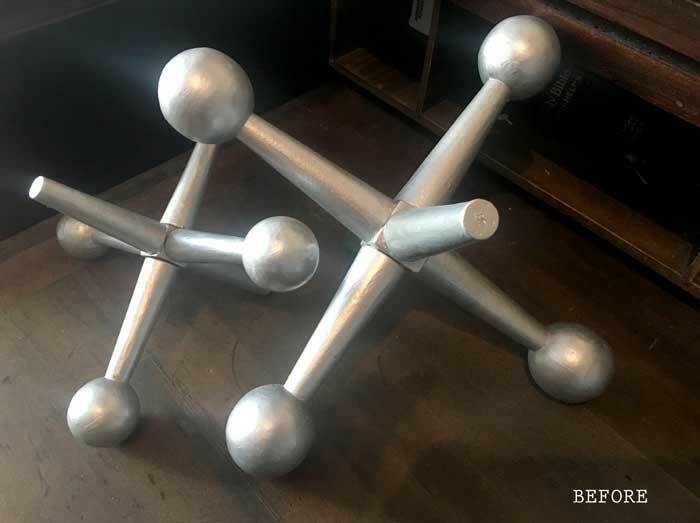 If you’ve ever look at old objects made from steel or iron, you will notice that most do not have a smooth finish. There is usually a subtle mix of colors and maybe even a little rust. Because of this, I wanted to begin with adding a little texture. It’s really not that hard to make wood look like a metal such as iron or steel. And, you can switch up your paint colors depending on the shade or type of metal that you want. Although, spray paint is easy to use, I like to use brush on paints. It’s easier to blend different colors that way and is great for distressed finishes. This step is optional but works well to resemble the imperfect texture of iron. Use the paint brush tip to dot on some small bumps. Smooth some on, with the full brush, to create some ridges or divets. You don’t need to go crazy with this. A little goes a long way. It also helps to have an inspiration piece to look at. 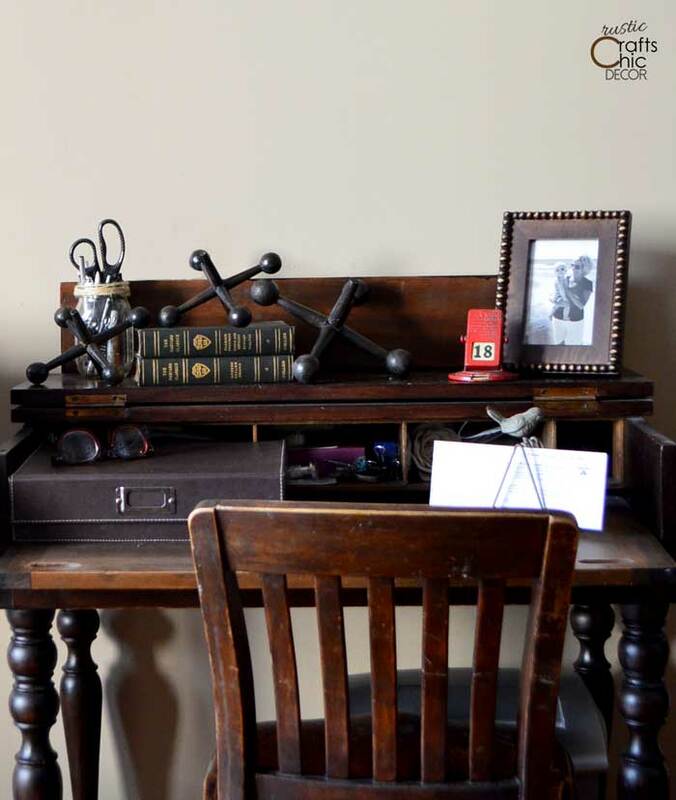 I used the Restoration Hardware photo plus an actual old iron pulley. 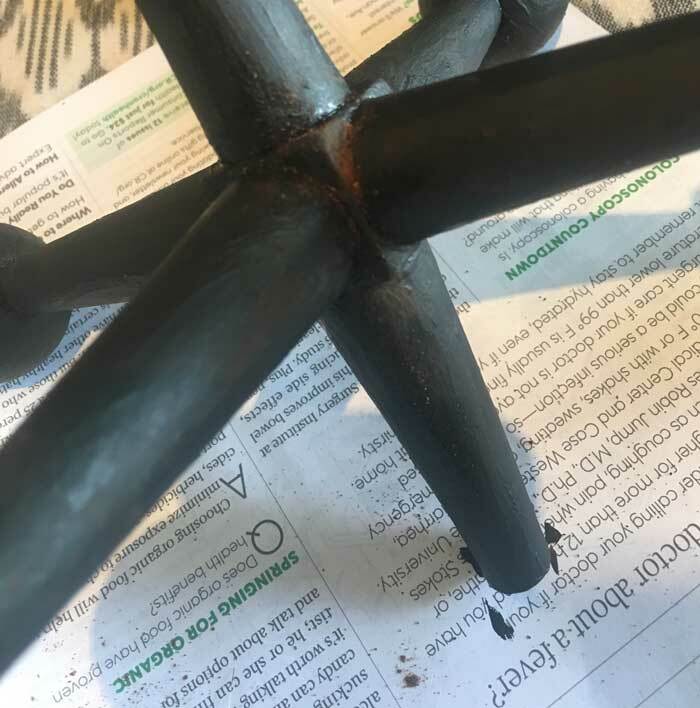 I mixed steel metallic paint with a plain black to look more like blackened iron. While the base coat of paint is still wet, apply some brown over the top in spots. Blend to get just a subtle difference in shades. A dark brown like espresso works good for this. If you want the object to look slightly rusted in some areas, just sprinkle on some cinnamon in key areas. Choose spots that might typically get more rust, like joints. Do this while the paint is still wet so that the cinnamon sticks. Wipe off any areas that are too heavy. Once the paint is dry, coat it with a light coat of varnish in a satin sheen.